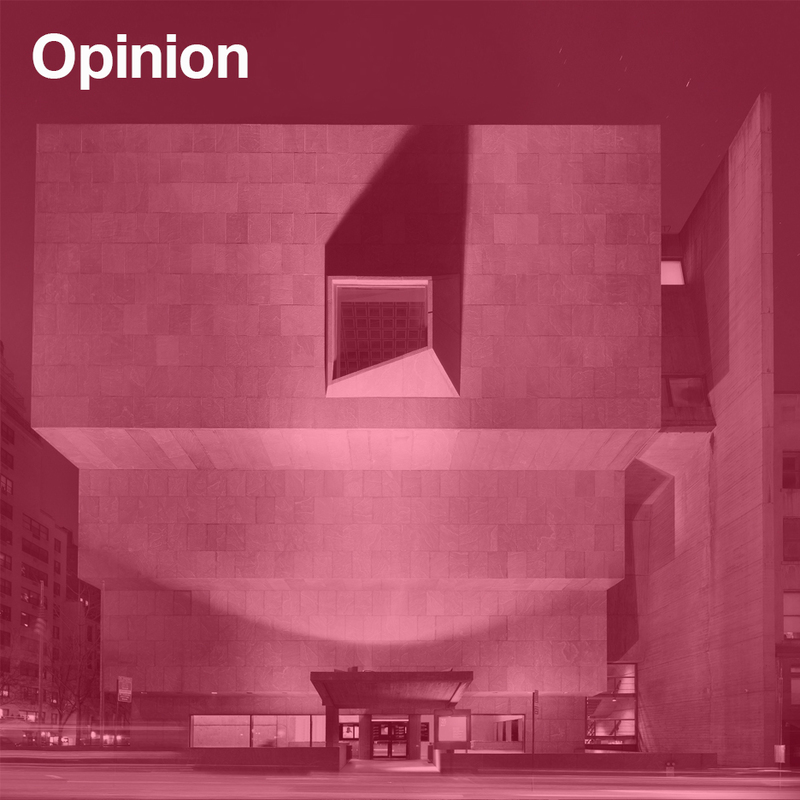 Opinion: the New York Metropolitan Museum of Art's temporary move in to the Whitney's old unprotected Breuer building is the result of behind-the-scenes machinations of a major donor. Thank goodness, says Alan G Brake. It might be surprising that one of New York City's best examples of publicly accessible modern architecture could be passed from one museum to another with no public oversight. Thankfully, the puppet master behind such a recent transaction appears to have been motivated by a dedication to both institutions and a love for the building in question, Marcel Breuer's 1966 home for the Whitney Museum of American Art on Manhattan’s Upper East Side. The inverted ziggurat in somber grey granite has been rechristened The Met Breuer as the new home for the Metropolitan Museum of Art's modern and contemporary exhibitions. It as if New Yorkers have a major new museum almost overnight. The wizard behind the curtain here was Leonard Lauder, the cosmetics magnate and art collector, who brokered the deal between the two museums as the Whitney prepared to move downtown to its new Renzo Piano-designed home, leaving the iconic Breuer edifice hanging in the balance. A major donor to both institutions, Lauder had considerable leverage with the Met – a cache of 81 Picassos, Braques, and Légers that he pledged to the museum. In the particular ecosystem of New York's prominent cultural institutions, a few dozen wealthy and powerful individuals – usually donors or trustees – often guide priorities and help set agendas, including curatorial and programming practices, and the real estate deals that determine what gets built where. Often the nature of these transactions is opaque. Arts reporters are dedicated to tracking these institutional players and projects, and watchdogs – including preservationists, cultural critics, and sometimes artists and architects – often bemoan changes to institutions they hold dear, but also routinely accuse of selling-out or betraying their own missions. At stake in this swap was one of New York's most distinctive buildings, "a piece of sculpture" as Thomas Campbell, director of the Met, called it at the press preview for the Met Breuer. In a city where buildings are shoved cheek to jowl and many present articulated facades to the street and utilitarian side walls of block or brick that assume their neighbours will rise or fall around them, Breuer's Whitney is a building in the round that suggests both a Cyclops and an upside down Mayan ruin. While the Breuer exterior is inscrutable, the interior is both legible and logical. Unlike Frank Lloyd Wright's Guggenheim, it is also a great place to view art – not too big or too small – it's the perfect place for mid-sized exhibitions, like the Whitney's hit-or-miss but never-to-be-missed biennials. With carefully planned circulation, a clear hierarchy of galleries and unexpected moments of relief, the building repels museum fatigue. Remarkably though, the building is not a city-designated landmark, so it could be torn down if institutional priorities shift. The Met has leased the Breuer building for eight years as it pursues a renovation and possible expansion of the modern and contemporary wing of its Fifth Avenue home nestled in Central Park. David Chipperfield is heading up that effort, which is sure to draw scrutiny given its location within Manhattan's most iconic leisure ground. The Met, according to Campbell, has treated the Breuer building "like a work of art under conservation". Architects Beyer Blinder Belle, known for their reverent renovations of Grand Central Terminal and the Empire State Building, polished the floors, oiled the woods, and removed some later accretions like shelving in the lobby. Breuer's original intentions are more alive than ever. Many expected the Met's curators to be more freewheeling outside their Fifth Avenue headquarters. One preemptive hack job accused the modern and contemporary department of promoting "international biennialism". But the first shows at the Met Breuer feel both confident and conservative, and very much within the traditions of the Metropolitan. A monographic exhibition of the late Indian Modernist Nasreen Mohamedi, her first in the US, accompanies a blockbuster show, Unfinished: Thoughts Left Visible, that examines how and when a work of art is completed. While Edward Hopper and Georgia O'Keefe often ruled the walls at the Whitney, the Met has brought in the big guns of the Western cannon from Rembrandt to Rauschenberg. The Met has positioned its new satellite as a place to showcase global talents and connect contemporary art to the masterworks of the past. Check and check. The Met should be credited with reanimating the galleries and welcoming the public back to an architectural masterwork (it's also one of the few New York museums with a pay-as-you-wish admission). But the larger question of the building's future remains. What will happen after the Met's eight-year lease comes to an end? The best outcome would be for the Whitney to operate it as a second location, given the expectation-shattering crowds at its Piano building downtown. In the meantime, the New York City Landmarks Preservation Commission should designate the building and give it lasting protection. While that wouldn't prevent Larry Gagosian or Tory Burch from turning the building into a stylish stage for their commercial interests, it would at very least prevent the wrecking ball and the next condo tower for the super rich from rising in its place. Alan G Brake is a design journalist, editor, and critic. Alan was formerly executive editor of The Architect's Newspaper and has written for titles including Metropolis, Architectural Record and the New York Times.